If you're fixing for a pow day high then boy oh boy do the DPS Lotus 124 Alchemist Skis have a little somethin' somethin' cooked up for you! Built upon the company's latest Alchemist Pure Carbon chassis, this Lotus 124 delivers an aggressive yet lightweight feel that's perfect for fast, sendy shredding in bottomless conditions. Finished with the finest details like UHMW sidewalls, World Cup-level bases and burly Rockwell 48c steel edges, these skis certainly reflect their handmade origins. Experience the euphoria of powder skiing like never before with the hard-charging, premium DPS Lotus 124 Alchemist Skis. Paddle Tech  Tapered, flatter sidecut section that blends at the contact points. It's the special ingredient that drives a uniquely smooth and intuitive sense of turn shape. Alchemist Pure Carbon  The world's most advanced ski construction takes a significant evolutionary step forward. Alchemist pure carbon skis are the ultimate expression of the craft. Next-level, vibration-tuned aerospace grade carbon ski construction melded with absolutely the finest in supporting materials. Alchemist skis retain the same historical shapes as their Pure3 predecessors, but due to the construction upgrades are notably damper and smoother in mixed and firmer conditions. Big Mountain Big mountain skis are designed for charging big lines with high speeds and big airs. These skis varry in width from wide, powder-oriented skis for skiing Alaska spines to narrower, mixed condition skis for ripping the beat up headwall at your local mountain. Skis in this category tend to be on the stiffer side, often with more rocker in the tip and less in the tail. Powder These skis are for the deep days. If you like to find powder stashes at your local resort, go on backcountry missions for the freshest of fresh or heli ski trips to BC, powder skis are what you need to stay afloat. 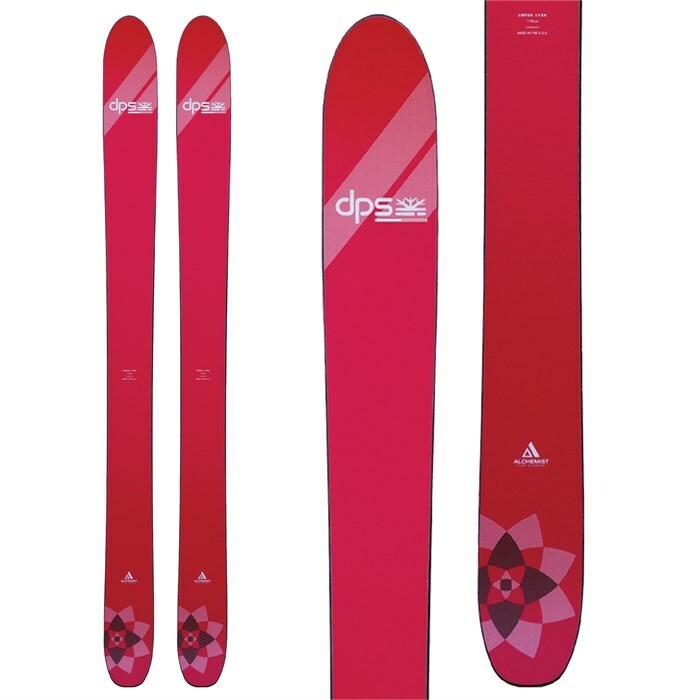 Skis in the powder category are wide and most often have some form of rocker or early rise plus a relatively soft flex. Many powder skis today are versatile enough to handle mixed conditions and harder snow. Alpine Touring Also known as backcountry skis, alpine touring (AT) skis are designed for going uphill as well as downhill. These skis are typically light for their width and many feature fittings that accept climbing skins. AT skis vary in width and weight, with the wider heavier versions usually used for winter/deep snow touring and the skinnier, lighter skis usually used for spring/summer/long distance touring. Long > 22 m radius is best for powder and big-mountain.